How to store and retrieve images from Access database using C#.NET windows application? In this article I will explain about how to store and retrieve image from access database using C#.NET windows application. Images are stored in the database as bytes. In my previous articles I have explained in detail about How to store and retrieve images from Access database using ASP.NET? similar like that resource I have store image in the MS ACCESS database but here I am using C#.NET windows application I alter some of the code based on windows application. Here I have use OpenFileDialog control to get image files from user and convert that image in to bytes then stored in the MS ACCESS database using like below code. 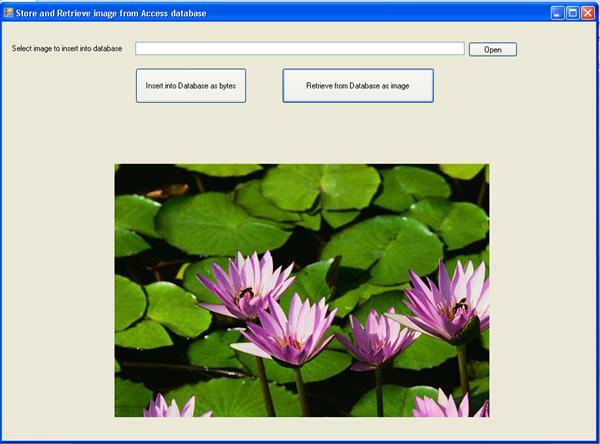 I hope that this article is help you to know about how to store and retrieve image from MS ACCESS database using windows form application. its only working with data type auto number id when i want to retrieve image from database.My question is that why its not working with data type number.Because its give in error "parameter is not valid.please can any body help?? Great Example, Appreciate and Thanks..
i face the error on insert value for conversion of image into byte......how to solve that prolbem?